Will Comets or Asteroids Hit Earth in June 2004? Someone called Aussie Bloke is scaring thousands of people with his theory that a dust cloud and comets or asteroids are on a collision course with Earth. His frequent messages are full of riddles, supposed "evidence", and conspiracy theory accusations which suggest that the governmental "powers that be" know what is about to happen, but don't want the public to know that disaster is just around the corner. While "Aussie Bloke"'s messages appear to have a air of authenticity, details in his messages suggest that he is not who he claims to be. Recent evidence includes Aussie Bloke's supposed admission of his "true" identity: an astronomer from Australia. We will not reveal that name here because we believe that Aussie Bloke -- whoever he is -- has hijacked the identity of a real Australian astronomer. Independent evidence on the web suggests that (1) the real astronomer has not published in astronomy for over 30 years, and (2) now owns a blueberry farm. We don't want to add to his woes resulting from what we believe is a hoax. Following are some issues that, we believe, invalidate the "end-of-world" claims of "Aussie Bloke". Orbital Mechanics: He knows the Earth will be hit, but not the exact time? The Earth travels through space very fast in its circuit around the sun. It moves one Earth diameter every seven minutes or so. In order for someone to "know" the Earth will be hit by an asteroid or comet, they would also have to "know" the time of impact very precisely. Put another way, if an object is on a collision course with Earth, but arrives a few minutes too early or too late -- it misses the Earth. This is why in recent years there have been a few occasions where astronomers have discovered a near-Earth object that is on a possible collision course with the Earth, and then a few days later with new observations and calculations, they find the object will miss the Earth by hundreds of thousands of miles. "Aussie Bloke" claims to know that the Earth will be hit sometime during a few day period in June 2004. Well, if he knows the Earth will be hit, then he also must know the impact time to within minutes. He even claims to know what part of the Earth will be hit -- this is simply not possible. The current technology in astronomy does not allow anyone, weeks in advance (let alone years, as Aussie Bloke suggests), that the Earth is on a collision course with any extraterrestrial body. The observations are simply nowhere near that accurate. Instead, objects that have a slight possibility of crossing the Earth's path in the future are indeed monitored, but uncertainties in their calculated orbits are so large that none can be "known" to be on a collision course with the Earth until they come very close -- maybe a few days away. 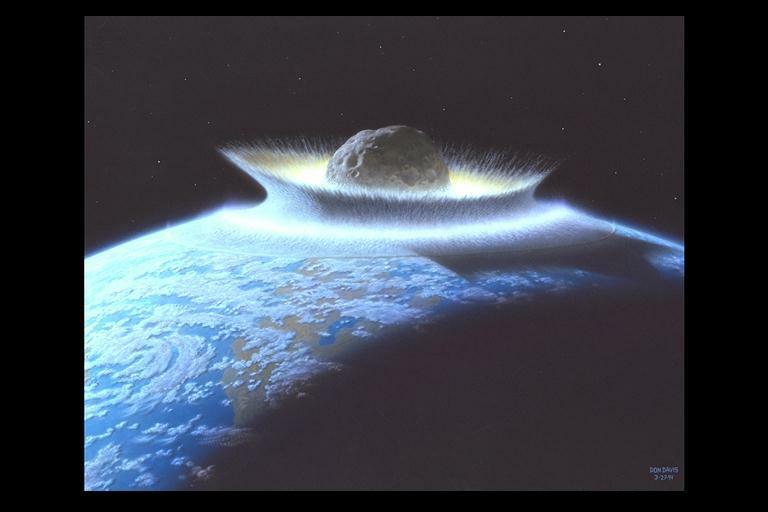 Any astronomer that has evidence of a near-Earth object that eventually collides with the Earth will be famous. Astronomers all over the world search the skies on a nightly basis for evidence of potential Earth-impacting objects. The SOHO/SWAN website mentioned above is being monitored by astronomers who would be quick to observe (and report) anything unusual or threatening. How is it that "Aussie Bloke" is the only one that has this special knowledege? Hmmmm. It is normal for large meteors to be occasionally observed, as has happened in recent weeks. If the Earth were moving into a cloud of debris, however, there would not be just a few sightings -- we would be having nightly, spectacular meteor showers. Is the Earth Dimming from the approaching "Dust Cloud"? Aussie Bloke and others point to evidence that there has been a reduction of sunlight at the surface of the Earth. Specifically, there is evidence from sunlight measurements at the surface of the Earth that less sunlight has been observed in recent decades. While there are instrumental issues involved here that might invalidate the whole issue, even if this has occurred we have Earth-orbiting satellites that been monitoring the intensity of sunlight for at least 20 years now. Other than the 0.1% variations due to the 11-year sunspot cycle, these instruments have not detected any change in the amount of solar radiation reaching the top of the Earth's atmosphere. If sunlight has been reduced at the Earth's surface, it is likely due to aerosol or cloud activity within the Earth's atmosphere -- not from outside it. Aussie Bloke appears to be a science-savvy person who knows just enough to be convincing. His attitude, however, is decidedly unscientific. Even though a real scientist would be very careful to point out how extremely unlikely a collision would be of any near-Earth object that has been measured months (or even years) in advance, Aussie Bloke reveals no scientific skepticism or hedging. It WILL happen in June 2004. The X-Files-like nature of his story suggests that he (or she) might even be a teenager who watches too much science fiction. It's unfortunate that this person has worried so many people over this issue. It is also unfortunate that this hoaxer has (we believe) hijacked the identity of an unsuspecting, real astronomer to perpetrate this apparent fraud. Because of possible legal trouble, we doubt that the true identity of Aussie Bloke will be voluntarily given up. Anyone can monitor the progress of tracking of Near-Earth Objects (NEO's) at NASA's Near Earth Object Program website. For instance, on March 18, 2004 a small asteroid the size of a soccer field passed within 3.4 Earth-diameters of the Earth (well within the orbit of the moon). At this web site, you can read about how these objects are discovered and tracked. The real Dr. Gartrell, the name assumed by Aussie Bloke, has come forward and made it very clear that he is NOT "Aussie Bloke". (In fact, when Aussie Bloke claimed to be Dr. Gartrell, he misspelled the name). June 9 Update: Our TechCentralStation.com article on the hoax.